Recent archival research has focussed on the material conditions of marriage in eighteenth-century France, providing new insight into the social and judicial contexts of marital violence. Mary Trouille builds on these findings to write the first book on spousal abuse during this period. Through close examination of a wide range of texts, Trouille shows how lawyers and novelists adopted each other’s rhetorical strategies to present competing versions of the truth. Male voices – those of husbands, lawyers, editors, and moralists – are analysed in accounts of separation cases presented in Des Essarts’s influential Causes célèbres, in moral and legal treatises, and in legal briefs by well-known lawyers of the period. Female voices, both real and imagined, are explored through court testimony and novels based on actual events by Sade, Genlis, and Rétif de la Bretonne. By bringing the traditionally private matter of spousal abuse into the public arena, these texts had a significant impact on public opinion and served as an impetus for legal reform in the early years of the French Revolution. 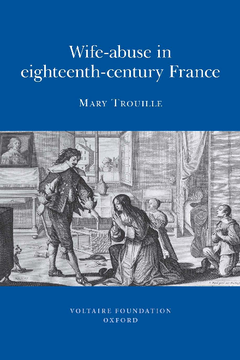 Trouille’s interdisciplinary study makes a significant contribution to our understanding of attitudes towards women in eighteenth-century society, and provides a historical context for debates about domestic violence that are very much alive today. viii. Rétif’s reformist impulses: a pioneer against spousalabuse?